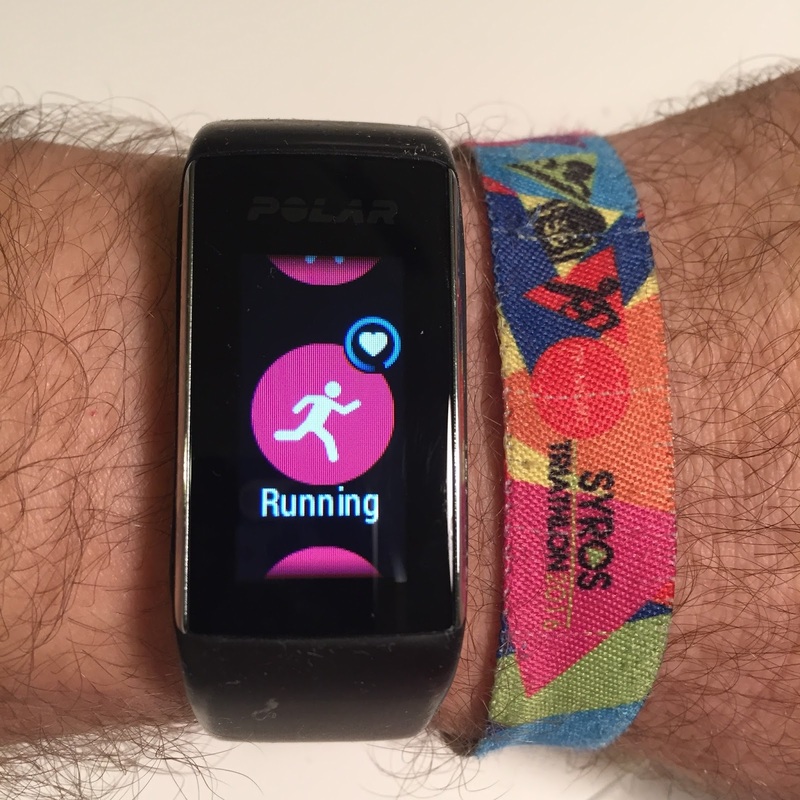 After reviewing Garmin Vivosmart HR last September, I decided to take a close look at the Polar A360 rival. 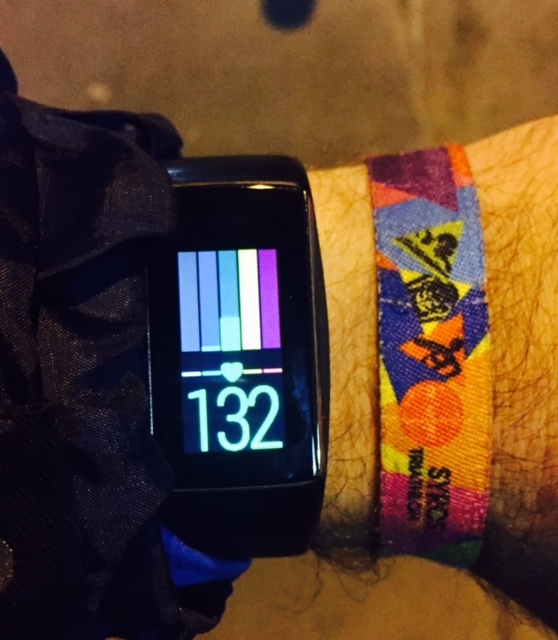 A 24/7 fitness tracker that measures your heart pulse on the wrist. 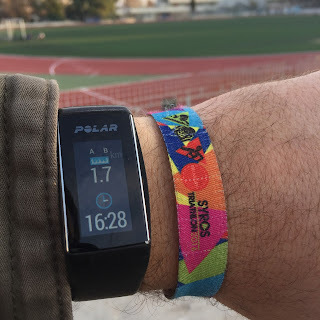 So I asked for a demo Polar A360 watch from Science Training in Greece for one month to try it out night and day, wearing it in all my activities so I can write a review about it. The clock stayed in my hand 24/7 for a month except the few hours that I had to charge it. I used it in walking, running, cycling, indoor cycling and swimming. 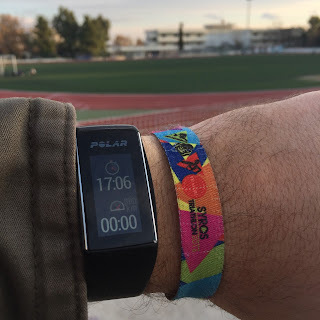 During the tests I always had the Polar m400 or the Polar V800 watch in my other hand to compare the recordings of the activities. I did not had to read a manual. All I knew was that the A360 can initiated using Polar Flow APP on my mobile phone or via a computer using the Polar Flowsync to be installed. In the second case, the micro-usb cable is used to charge the device. 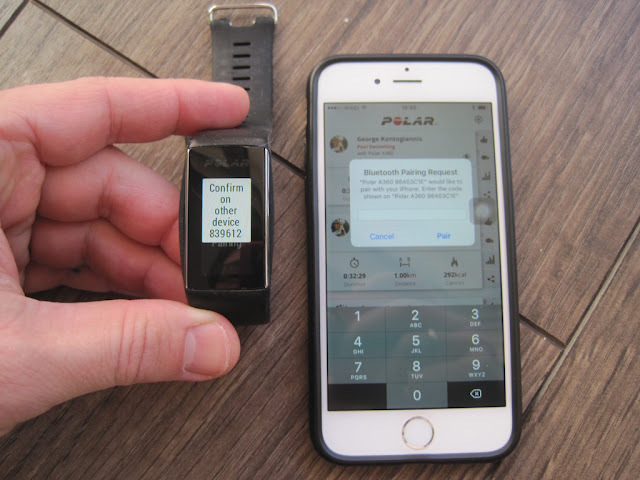 Polar A370 is out on the market with some more features ! For a quote about Polar A370 press HERE. Shape. 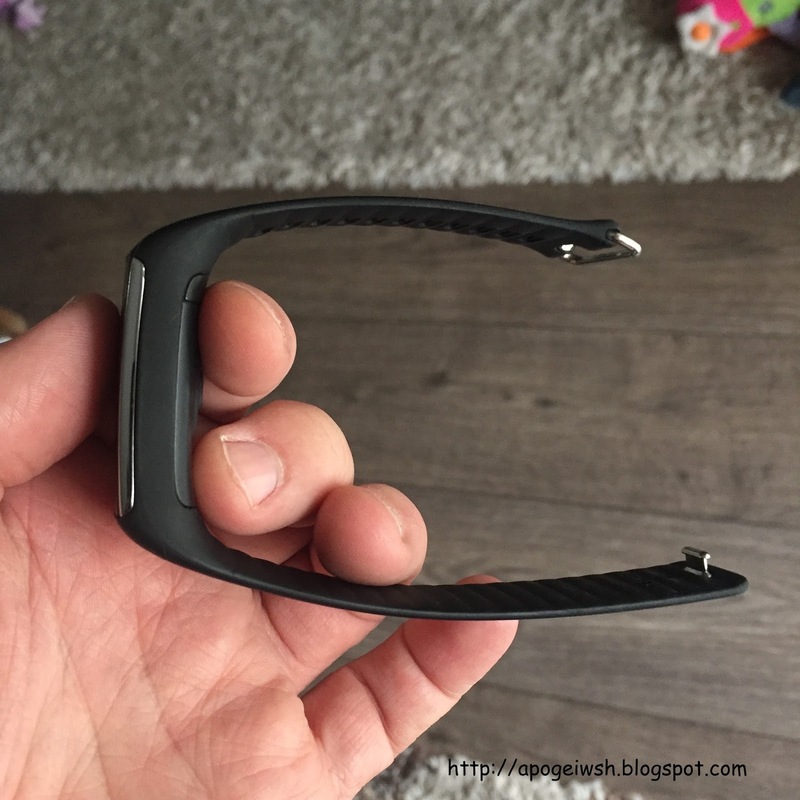 The strap follows the width of the watch as a band, a single strip. Ideal for those who do not want square / circular watches on their wrist but want something more distinctive that will suit their personal aesthetics / style. Optical sensor does not project too much and it won't make a mark on hand while wearing it even if someone binds it tight. Rubber strap of the A360 I used was kind of old. Newer models has two clapss in order to avoid a random unclip when caught somewhere. My daughter couldn't stand away when she saw the A360. Luckily I kept it safe out of her little hands. Rubber band is detachable and can be changed by the owner without a tool. 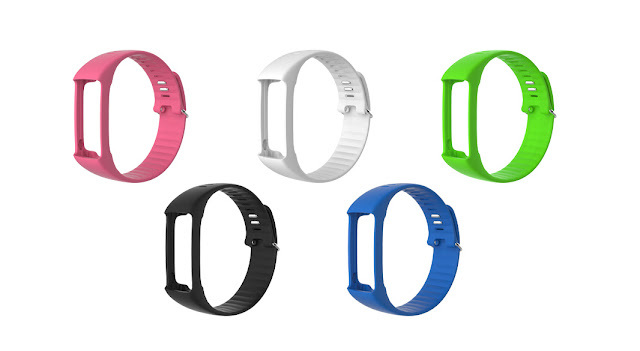 Main body of A360 is capsule shaped and it is secured in the band with two simple moves. Notice that there are other fitness trackers that have a not interchangable band and if it wears out you just have not another option than throw it away. On the second image under the lid you can see the mini-usb charging port. There are a lot of available rubber bands in white, pink, green, black and blue. Also there come out int three different lengths for all sizes of wrists. Let's have a first look on the menu. We do see the current day and what is left to be done in order to suceed and get our daily goal. 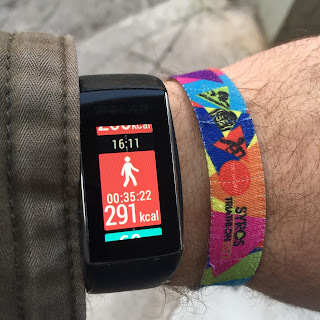 Daily activity is just 4% complete, I have walked about 542 steps and that is estimated as 0.2km (pic was shot a little bit after I woke up in the morning). I have consumed about 977 kcal. 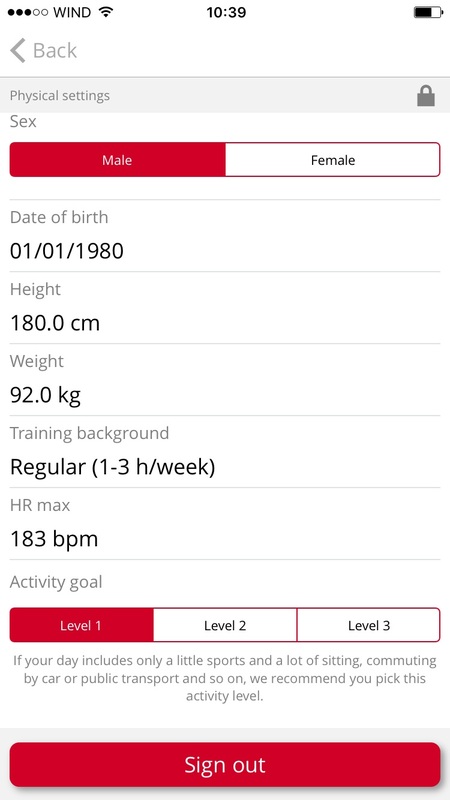 (Kcal are measured considering our metabolism starting from 00:00 and are totally depended on age/weight/activity factors. 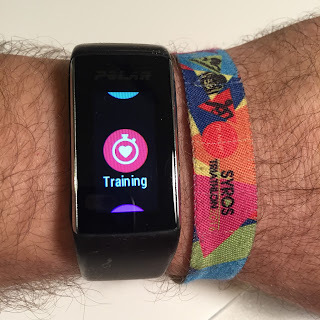 With a single tap the screens shows ways to to reach your daily fitness goal. And that would be in my case with a 55min jogging, or a 2h5min walk or 7hours of standing and doing house chores. And these change drastically when you are living already a busy day with lot of movement and activity. 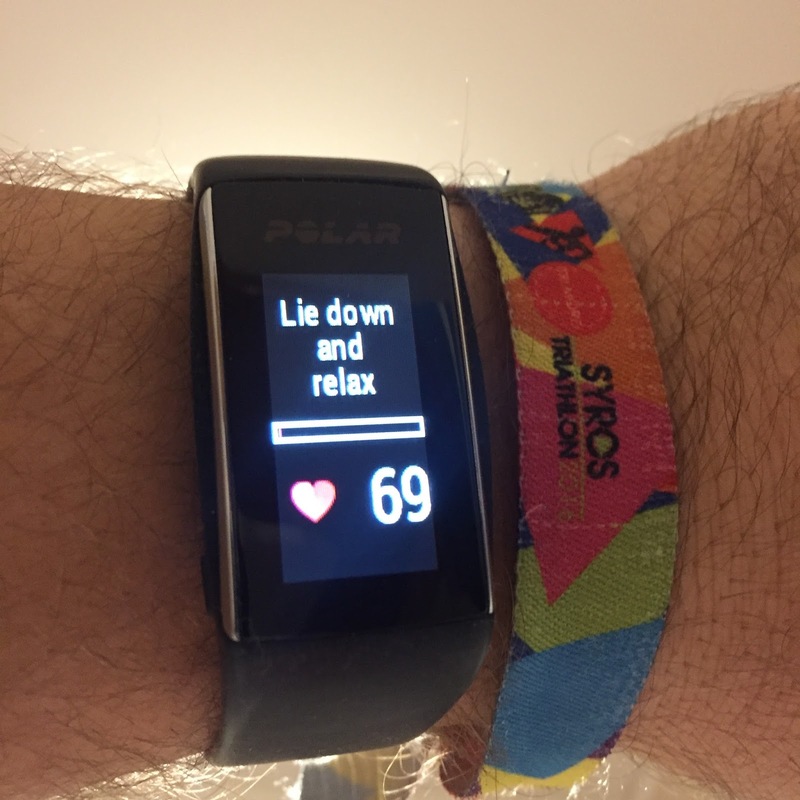 Pressing it activates the sensor and searches for pulse. 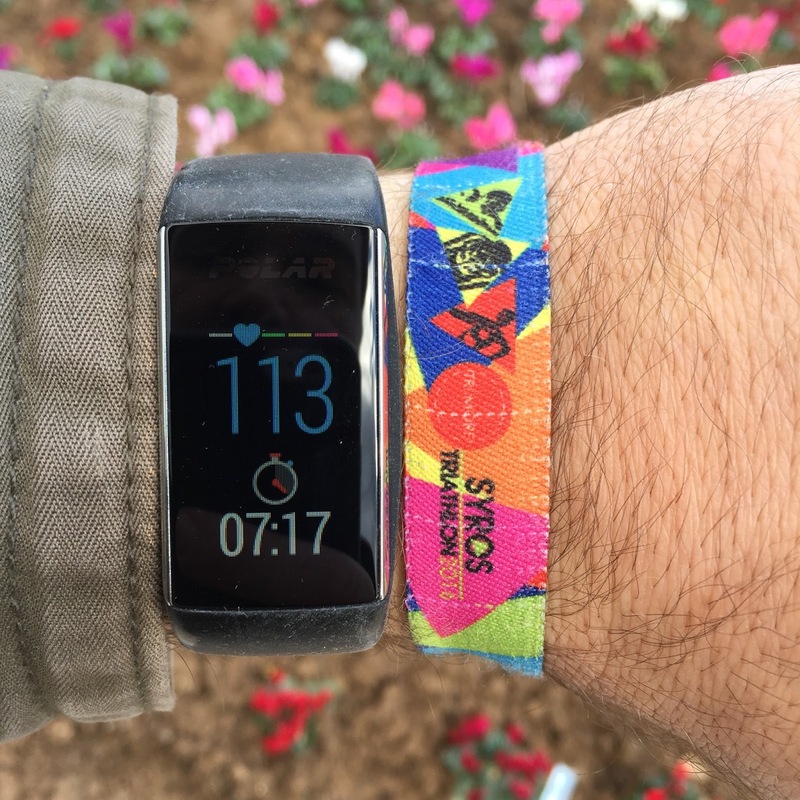 By putting it on our wrist or by putting our finger on the sensor we will see in a few seconds a first measurement that takes a few seconds to stabilize. Pulse measurement technology with light is called photoplethysmography. The clock here works as follows. The 2 green LEDs illuminate the skin while the light sensor in the middle detects how much light is reflected back. Each passing of new blood flow from each pulse changes the detected light reflection values. This calculates how many pulses are present in the unit of time and shows us the current count. So we need skin, wrist and blood to roll. You need to be alive It concerns only living ones. From the training screen you do start all recordings of your activities. Initially you do find walking and running in the list. And while searching your desired training mode the sensor already tries to get your pulse so it can be ready when you actually tap to start. 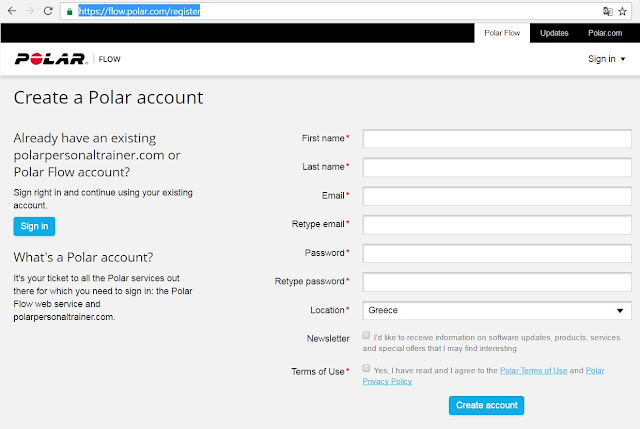 This also helps us to categorise Polar Flow activities, the Polar online platform. The most important thing is that for each prefix the movements of the wrist are detected and in combination with the pulses the calories consumed during exercise are counted. The available exercise styles or "sport profiles" as stated by Polar Flow App and the Polar Flow platform cover sports that one can imagine. From alpine ski to badminton! 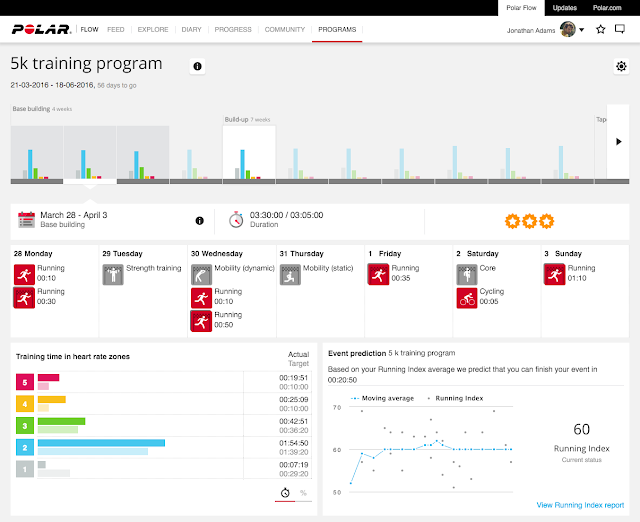 Only these options are initially available in the Training menu. After connecting to Polar Flow, we add the other sports profiles we have in our account. Before we start anything, let's sync our device with our phone. 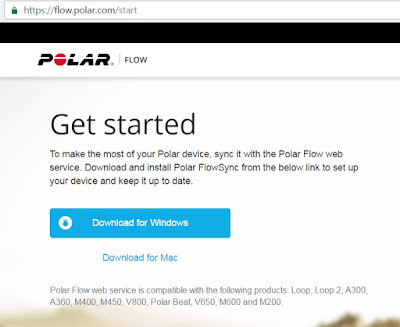 We will need to install the Polar Flow application if we do not already have it. Then we will then link to our existing Polar account or create a new one. 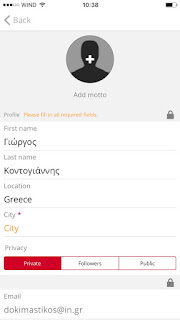 Going to our profile, in Settings, we see several text boxes regarding personal info. We complete our profile. To get accurate and precise measurements, we state our true age, weight and height. 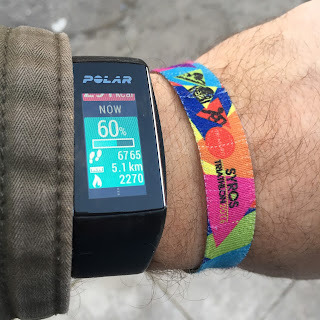 From now on polar Flow will be our personal "assistant" in making / acquiring / maintaining / supervising the progress of our physical condition, so let's be ... honest, eh? Similarly, we can do the same thing from our computer. 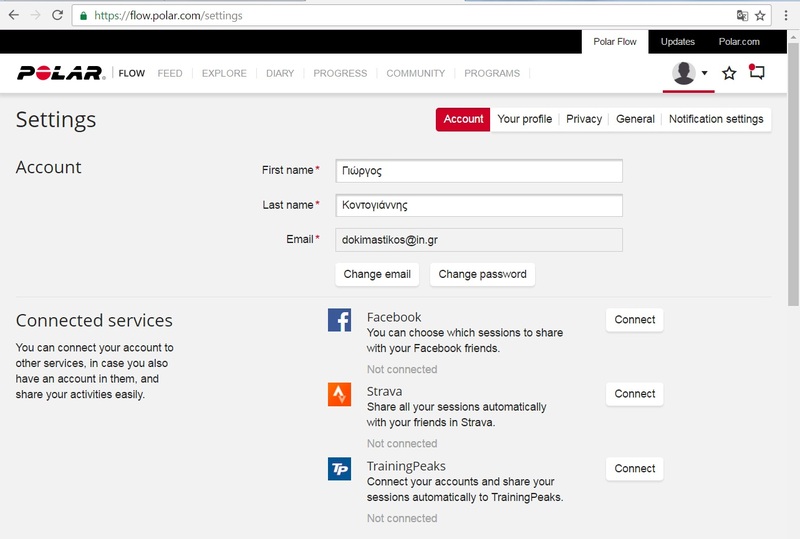 To create an account on Polar Flow we do press here. Συμπλήρωση των στοιχείων μας για το λογαριασμό μας. The account was created. We go to the Account profile. 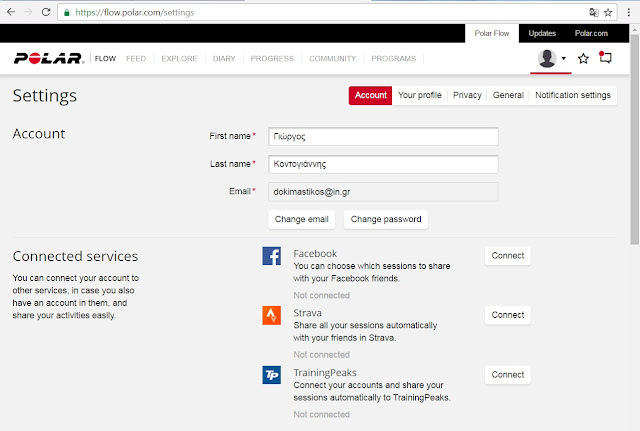 Here we can fix our name, email or link our account to Strava, TrainingPeaks or our Facebook account. 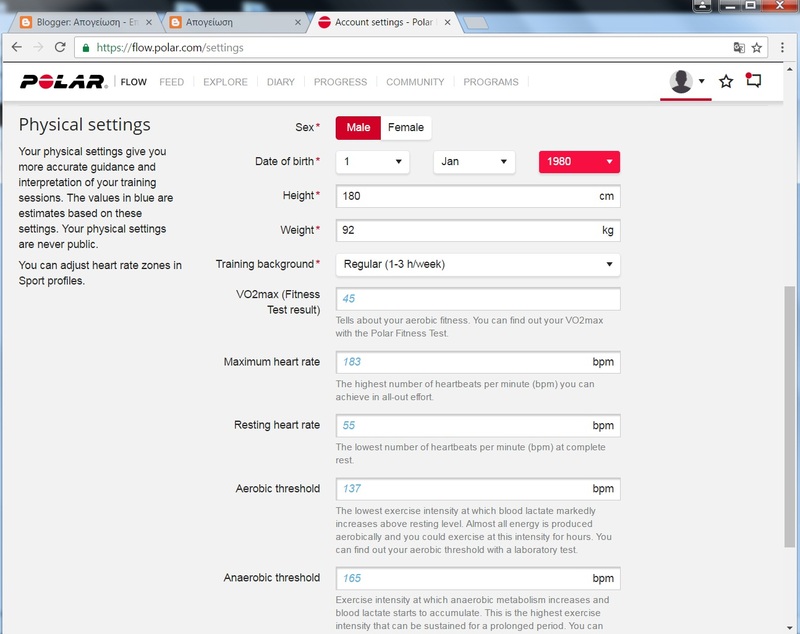 Here are the settings for our physiology. 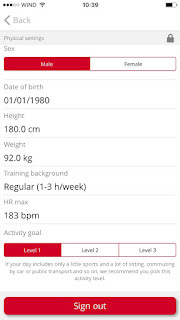 Weight, height, date of birth as well as heart settings such as heart rest, maximum pulses, aerobic threshold and anaerobic. (for maximum pulses, aerobic and anaerobic threshold is recommended to be an ergometric test in a specialized center). If we do not have the results from an occupational test we have done recently, it is best not to hurt these values ​​as they determine the pulse bands and will affect the results of the recordings. 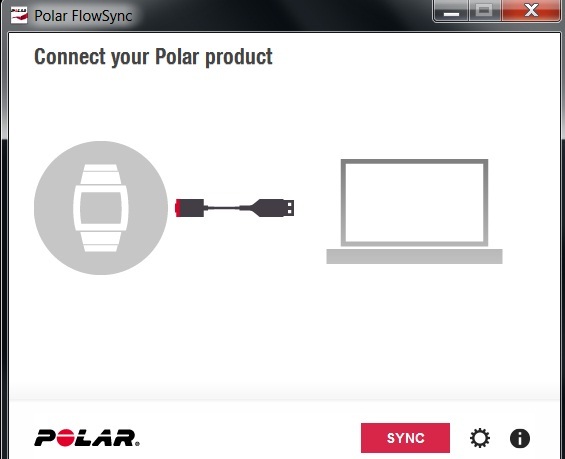 To synchronize our device with our computer we need Polar FlowSync, which can be found here and it available for bot Windows & Mac. 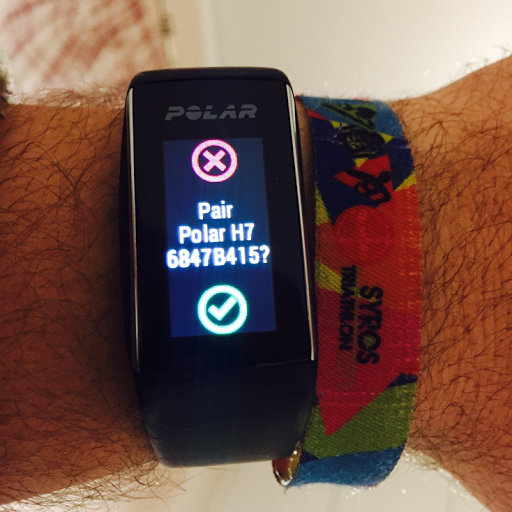 We use our email & password that we have created from the website in order to login and link and synchronise our Polar A360. Initial pairing of A360. To start the synchronization process, we need to have the bluetooth on the phone and the Polar Flow application open. Then we press the left button on the Polar A360 for 2 seconds (one is in, one is forbidden to lose) and the device detection starts. 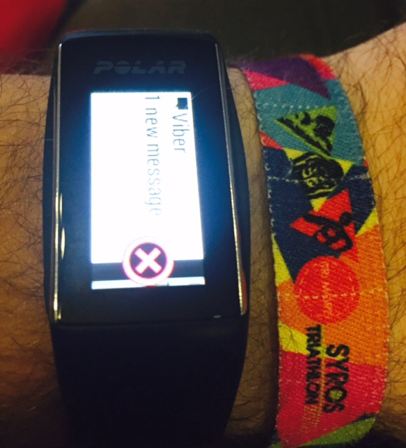 Our device encourages us to "touch" the clock with the device we want to sync. 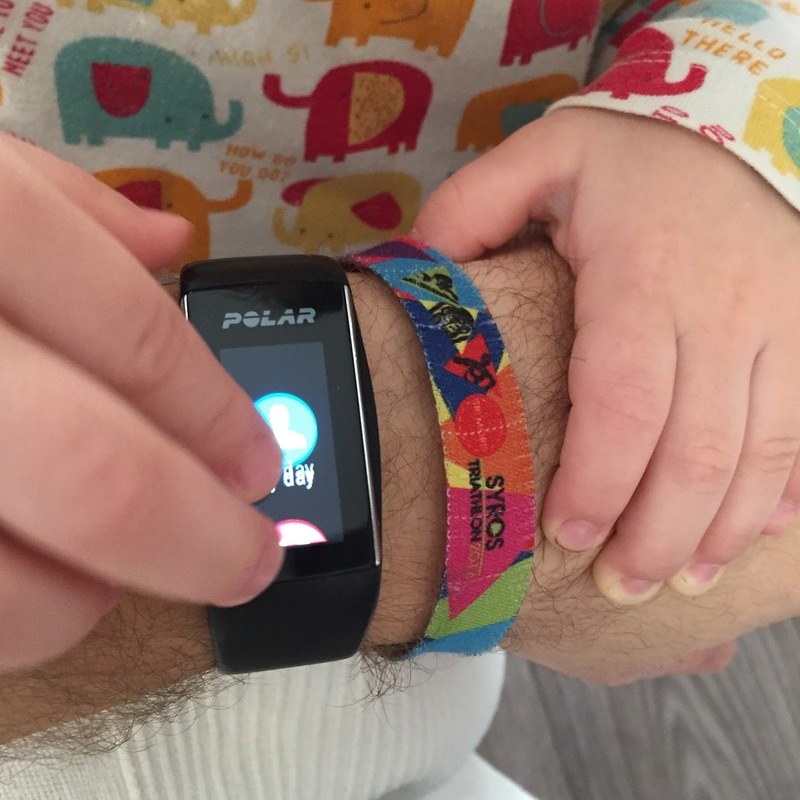 A light bump between devices starts the Pairing process. Pressing the sync button for the first time prompts usb to usb or to connect via bluetooth. The bluetooth service must be turned on our phone. 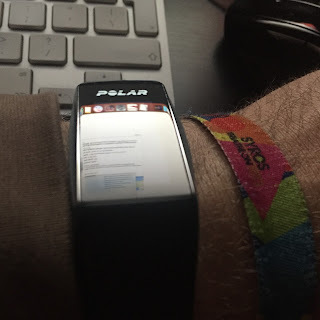 After the light bump, the two devices do recognis that the Pairing process is about to begin, and the number that the Polar A360 displays is required to be typed on the phone. A360 started its initial setup sync. 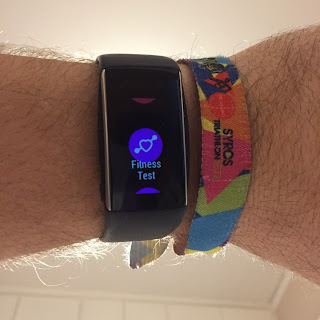 When the first synchronisation is complete, we have to fill some details as the hand we will wear the product, set the alarm clock on a daily basis or Monday to Friday, and finally decide if we want to see the Smart Notifications on the A360 screen when they appear and on the phone. That's amazingly useful as we do not have the phone all day long but at a glance we can see the notifications without having to look at it. After every change in our Polar Flow preferences, we need to make a synchronisation of the A360 in another weight or add-on Sport Profile. For some it is highly important to have a clock with "smartwatch" capabilities and not for everyone. The device does not keep a history of notifications. Each alert appears for a few seconds and disappears or we can close it earlier by pressing X (The alerts stay on the cellphone, of course, they are not lost). Changing faces in Polar A360. 4 different options. To be honest it was all I searched on the internet to see "how" the first screen is changing. But it was so simple. 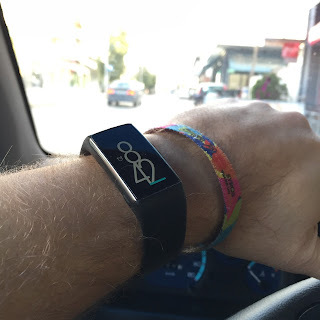 Turn on the screen by pressing the side button or bringing the wrist in front of our face, then press the screen for a long time and lets us choose from 4 different options. Για να είμαι ειλικρινής ήταν το μόνο που έψαξα στο ίντερνετ ώστε να δω "πως" γίνεται να αλλάξει η πρώτη οθόνη. 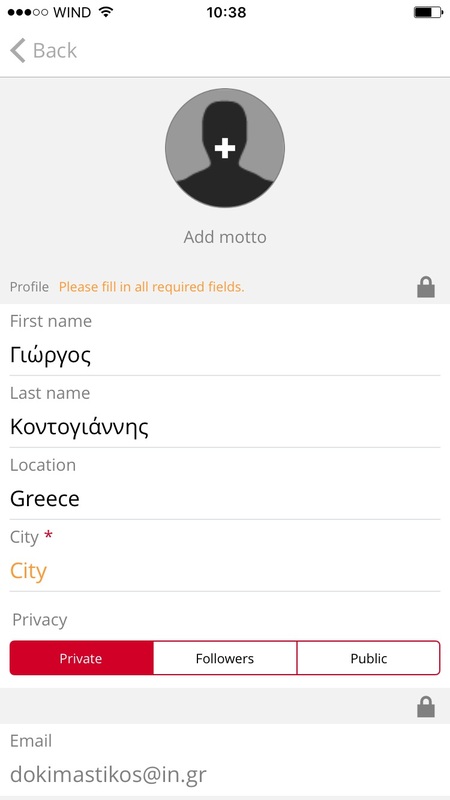 Ήταν όμως τόσο απλό. Ενεργοποιούμε την οθόνη πατώντας το πλαϊνό κουμπί ή φέρνοντας τον καρπό μπροστά από το πρόσωπό μας, Έπειτα πιέζουμε την οθόνη παρατεταμένα και μας αφήνει να επιλέξουμε μέσα από 4 διαφορετικές επιλογές. The first choice is the one I enjoyed the most. The time with large white letters on two lines as long as we reach day's fitness goal of the day are colored blue from bottom to top. Time and date in orange letters as long as we reach day's fitness goal of day become yellow. 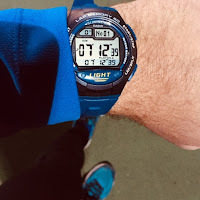 Time with white letters on two lines, date and bar that fills with a blue colour as we get to reach day's activity goal. Two circles face. 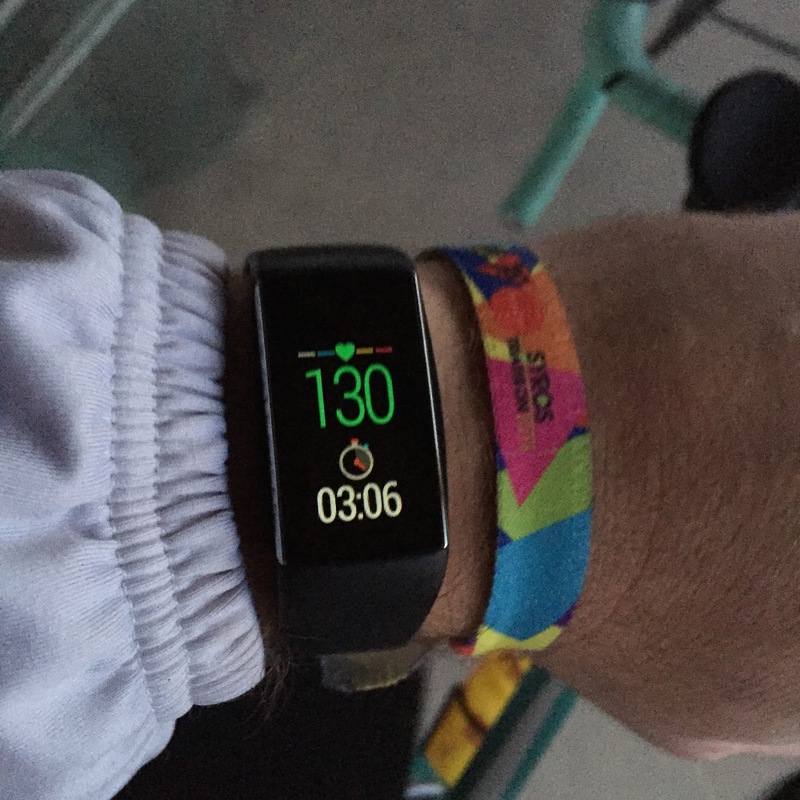 The top has an analog clock with day and date, while the lower circle represents the activity of the day with a percentage. 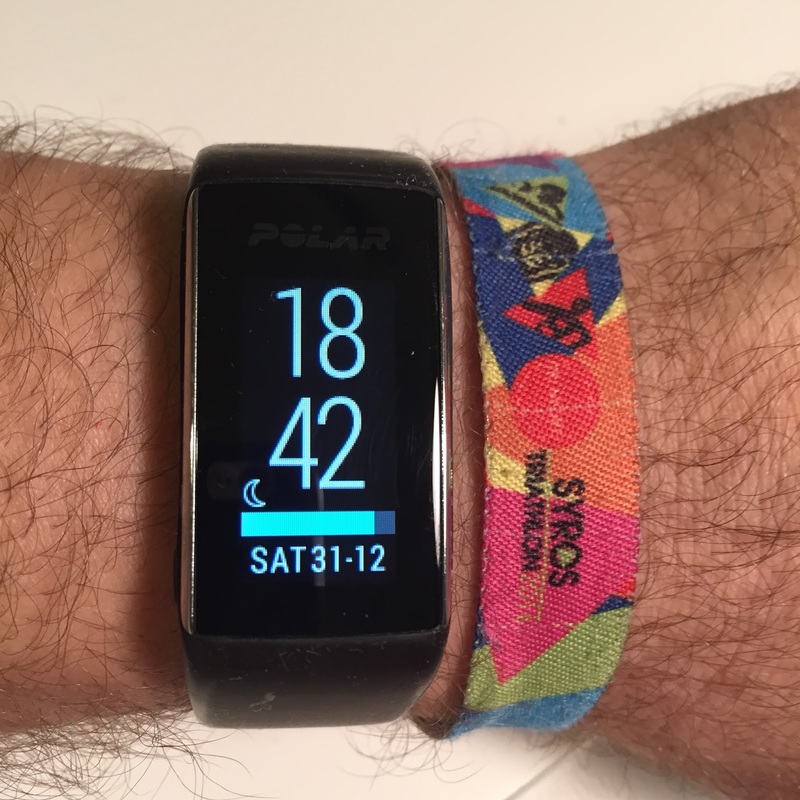 What is it like having the A360 on my wrist? These are some photos from various hours and days. 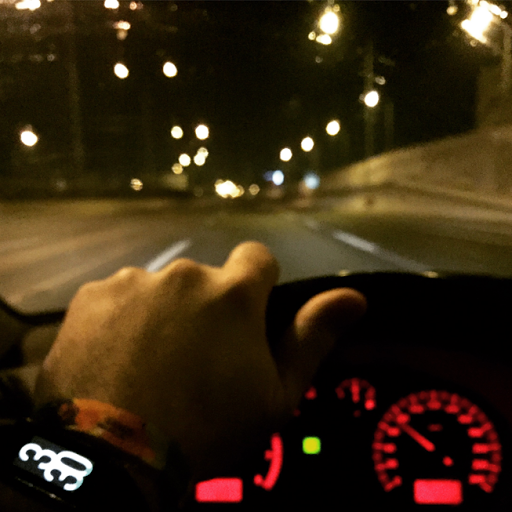 Driving day and night. 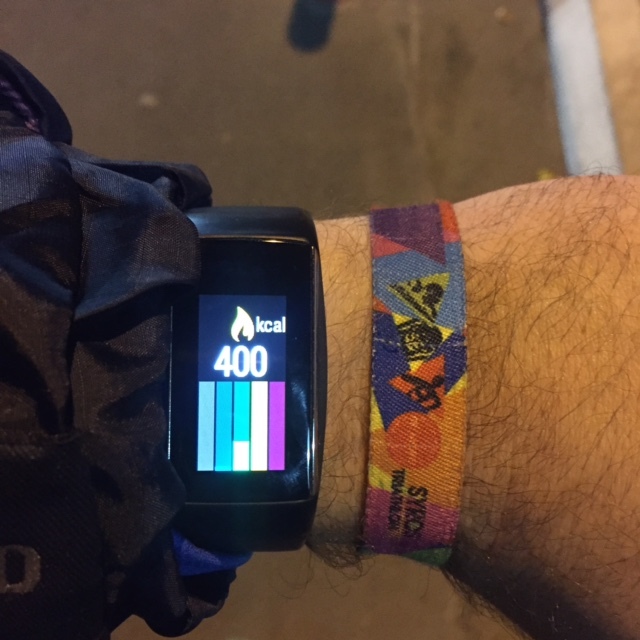 With a twist of the wrist, the screen turns on and with the big letter screen mode it is difficult to draw our attention away from the street for long. Walking to work with an walking activity started. Hey dady, what does it do? Let me try to fix it!. But lets see what it actually does while on activities. So lets start with a simple walk. Sliding to the menu Training we do select Walking. After a few seconds the pulse on our wrist is detected and we can press the button to start logging the activity. Views of A360 while on activity. Changing to a next view is done by sliding up or done with our finger. Time is 16:50 and I've been walking for 9 minutes and 42 seconds. The second image shows the current heart rate zone. The clock has calculated that I have burned 148 calories so far and covered 1.7km. Time and pace. Once you stop walking, the pace drops to 00:00. 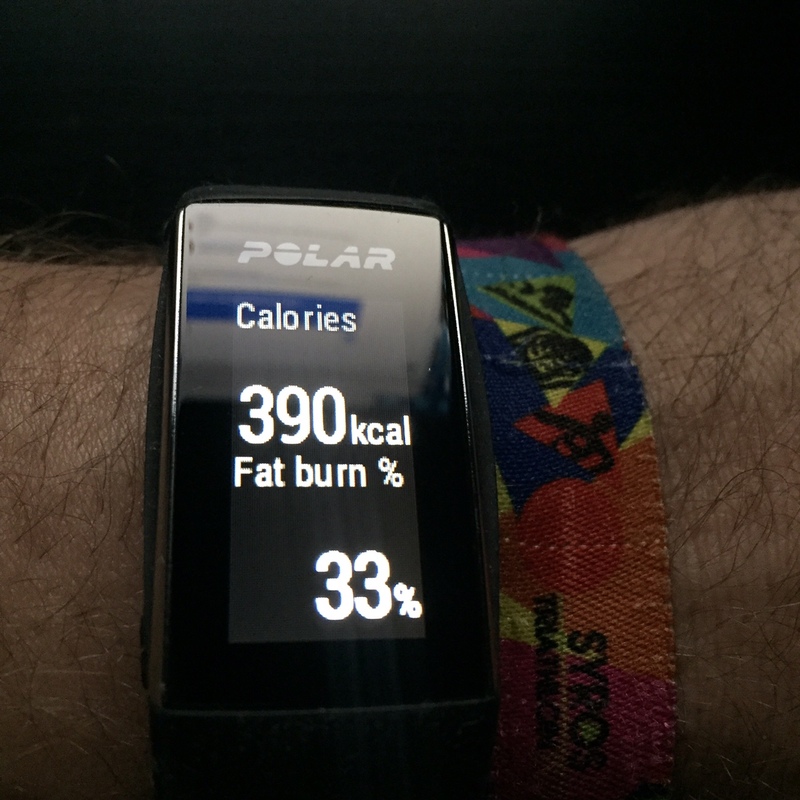 On the right there is a calorie display and and hearth rate zones. 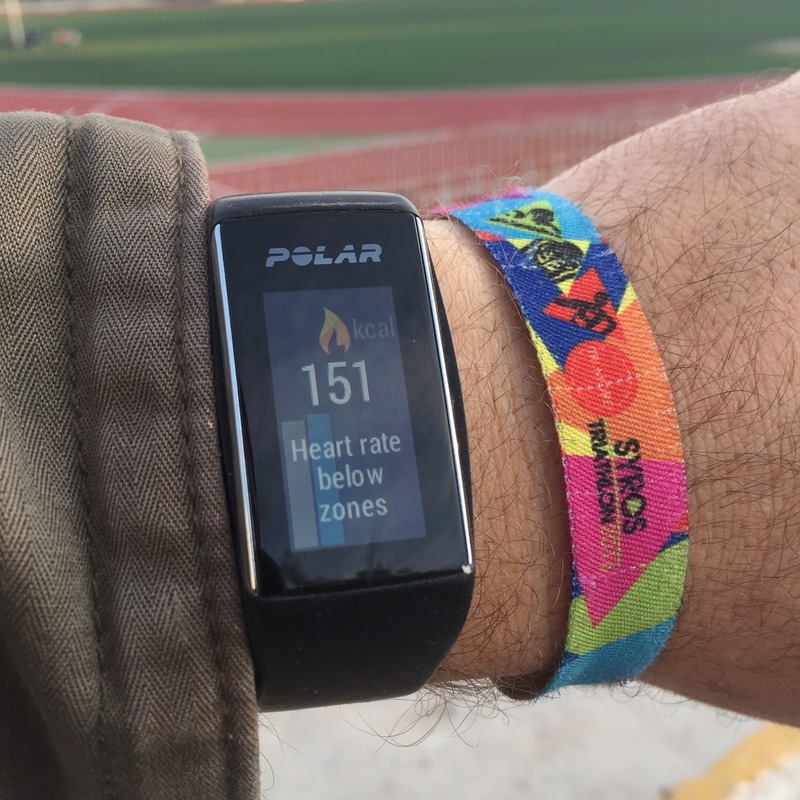 If you current pulse is below 1st heart rate zone you get a message like this "Heart rate below zones". Time and calories. For those who are targeting calories during exercise. Start time and duration of the walk. Average pulses 107 and maximum 121. Pace average 09:28 min/km and a maximum of 07:30min/km. In the second screen, percentange of time spent in each heart rate zone. During this walk I had with me the Polar M400 clock with the H7 Hr strap to compare the pulse recording results in the wrist with the chest, distance and calories calculated by both the device and the other. 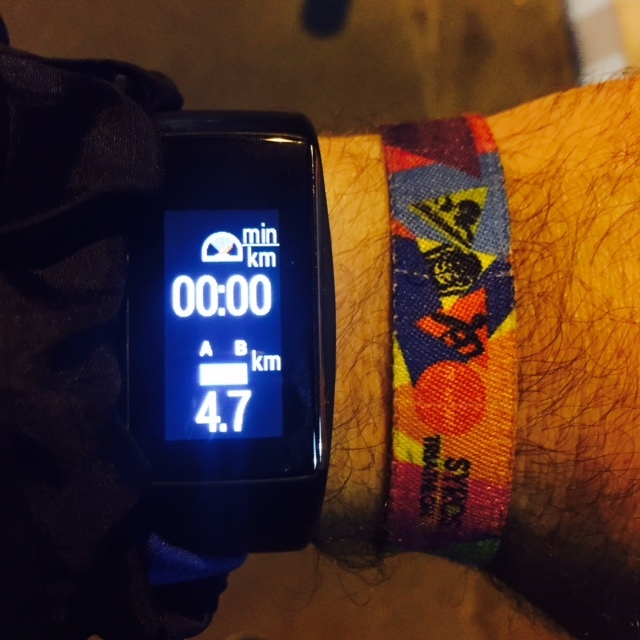 The M400 recorded the distance with GPS while the A360 with its built-in accelerometer. 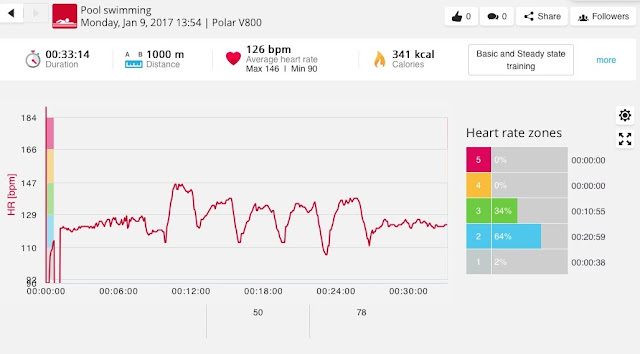 But it was identical to heart recording and the calories calculated for the activity. 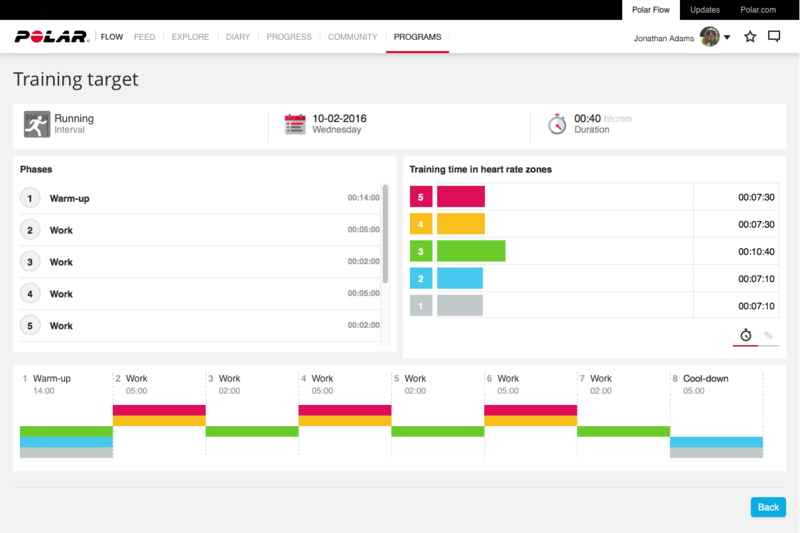 From Training we scroll down our screen and select Running. 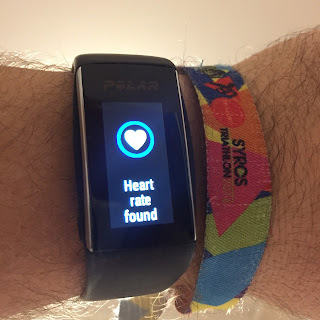 We are ready to roll as soon as it detects our pulse! Some pictures from the day I tried the A360 on the run. 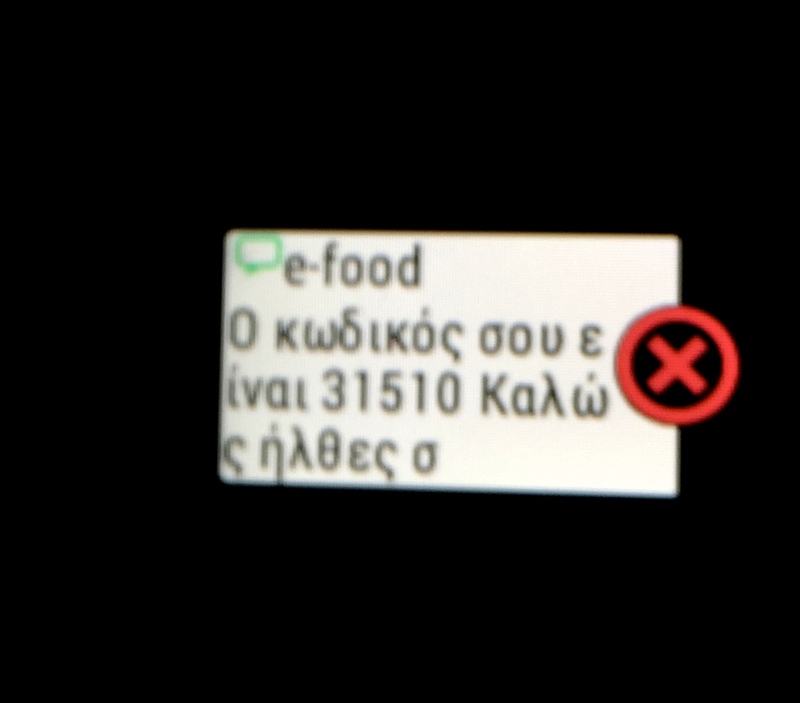 1η εικόνα. Θερμίδες που παραμονή σε ζώνες άσκησης. 2η εικόνα. 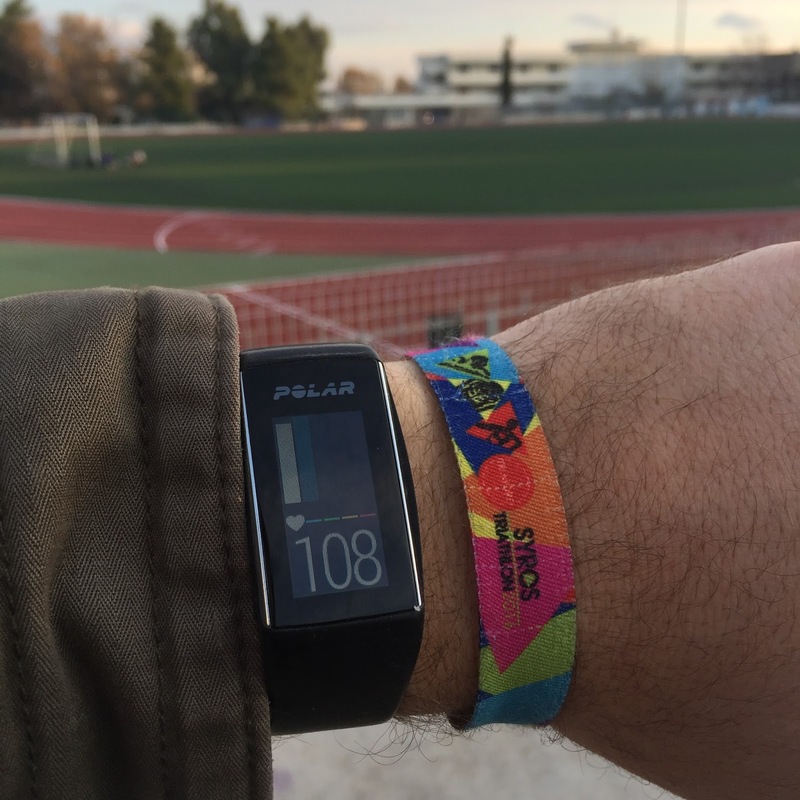 παλμοί 119, χρόνος δραστηριότητας 29:36. Picture 1. Rate (at 00:00 as I stopped to take the picture ) and distance I've traveled. Picture 2. Heart rate zones and current pulse ration. I am at 132 bpm. Similarly, a green heart flashes in the corresponding zone and shows where is this heart ration. Picture 1. Percentage of stay in each zone. 72% in zone 4, 24% in zone 2. 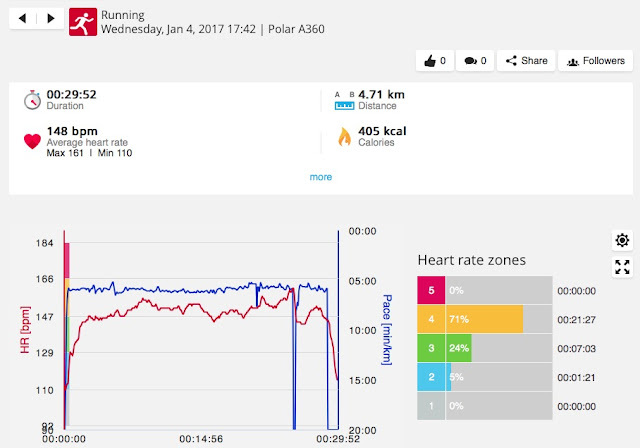 As with other sports, I used simultaneously another Polar device with me to make a comparison of distances / calories / heart recording. 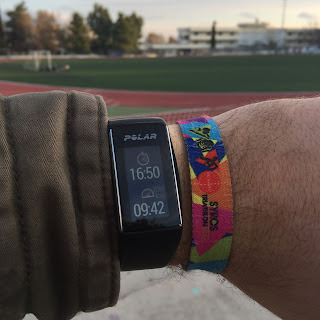 So in the run I ran with a Polar M400 and the Polar H7 heart rate belt with me. A small difference in heart recording is observed at the beginning of the pulses, but they are recorded identically throughout the duration. (red line in the next two layouts). Also, in the A360 recording, the timer wrote a minute longer, and so the pulse line appears to go down. 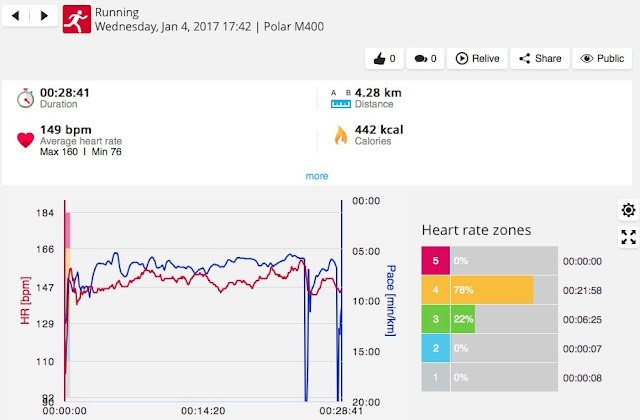 Again the A360 recorded a little more distance, 400 meters longer than what the Polar M400 wrote with the GPS. I uses several times the A360 in the bike trainer along with the triathlete watch V800 to compare the results. Here are photos of the duration of indoor cycling and how they look after the results of the recording. The time is 17:26 and 02:43 minutes have passed since the start of the exercise. 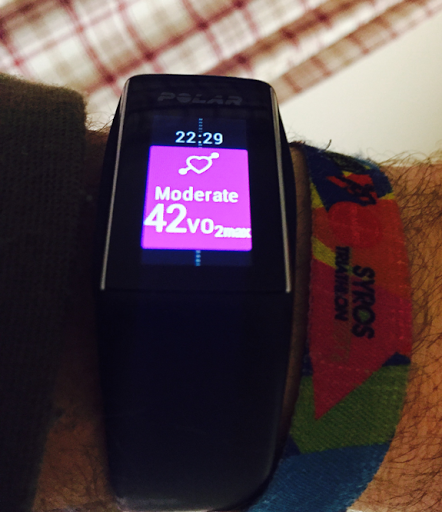 In the second picture our pulses are 130 while we are at 03:06 minutes of exercise. 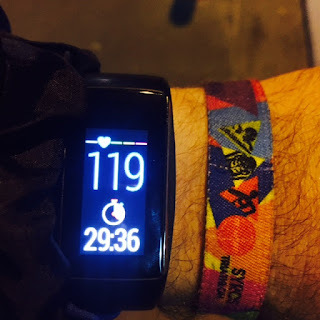 Current Beats per Minute ratio and time. 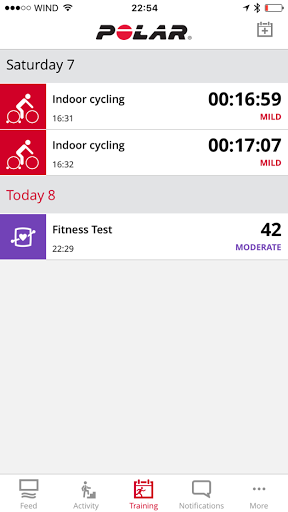 Indoor cycling activity as shown after completion. In the My day menu there is a cycling activity. Pressing on it we see more details about it. 27 minutes of duration. 314Kcal calories. Start time and duration of the specific activity. 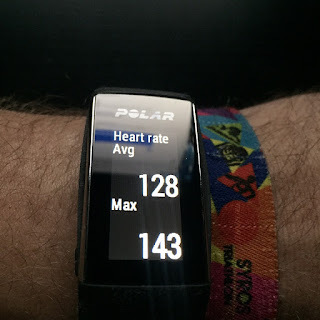 Average heart rate 126. Maximum heart rate 146. 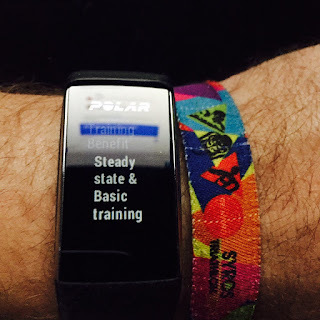 Training benefit calculation shows that it was a Steady state &Basic Training kind of activity. Time of spend in hr zones 1, 2 and 3. Finally I did an hour of cycling in the trainer and recorded it simultaneously at the A360 and the Polar V800 in combination with the Polar H7 breast pulse belt. The chart is very converging with the V800 being a little slow at first to catch the correct pulses. 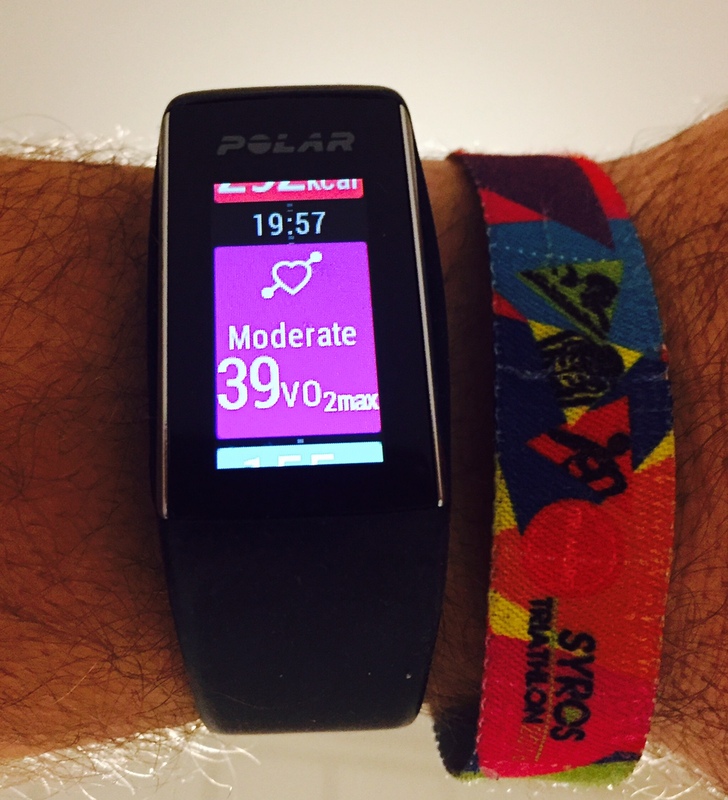 The drop of pulses on 00:20 is due to releasing the band of the A360 and tightening it up a bit more. Here I really am very surprised because while it is not advertised for recording pulses in water it does quite well. 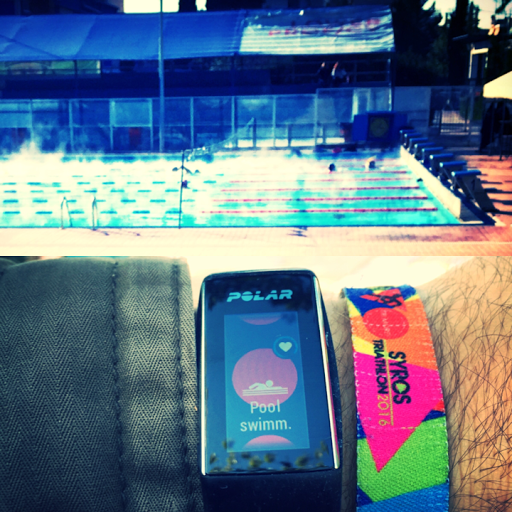 I tried the Polar A360 in a simple 1000m swimming session that I had to do 300m warmup, 5x100m in aerobic zone 3 and 300m could down. I used προπόνηση με το Polar V800 with Heart rate H7 to record the activity. Comparing both recording I find the results very surprising for a watch that is not sold for this purpose. 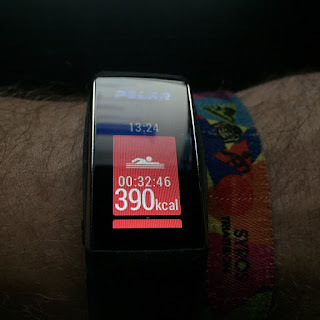 I mean, selecting the corresponding Sport Profile of swim and swinging the hands swim will calculate calorie consumption anyway, but it seems at the same time capable of recording the pulses in the water. In the Myday menu we have a new swimming activity. By pressing on it we see more information. 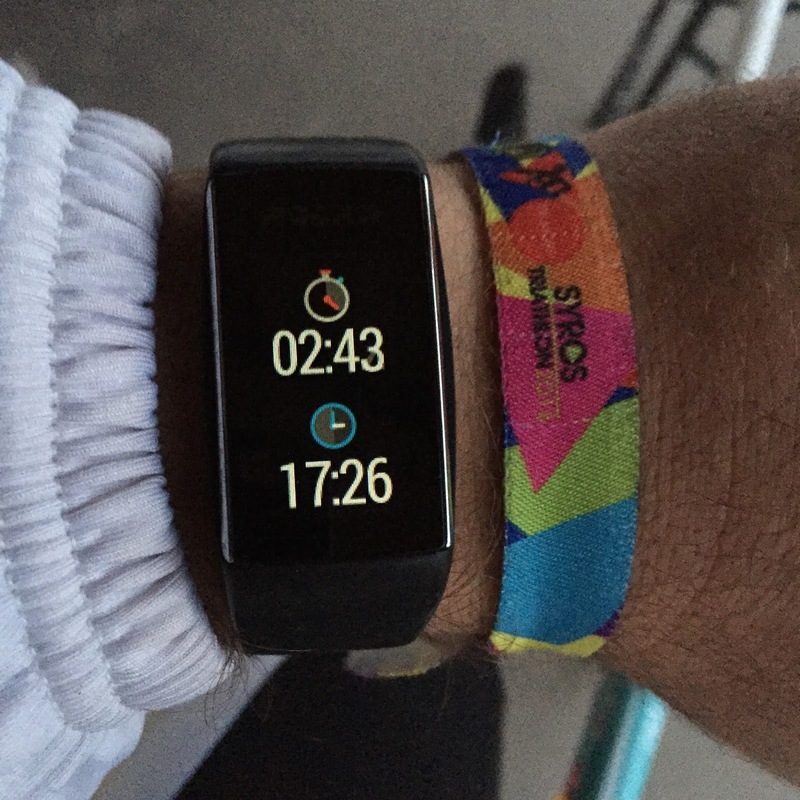 Activity start time and duration. Average pulses and maximum pulses detected. 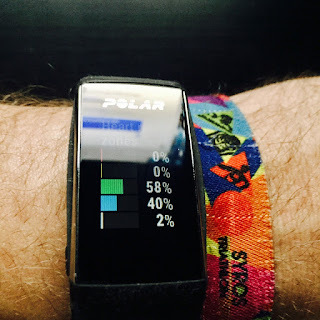 Percentage of stay in the pulse bands. Type of training. Aerobic base training. 390 calories were consumed and 33% of it was fat. 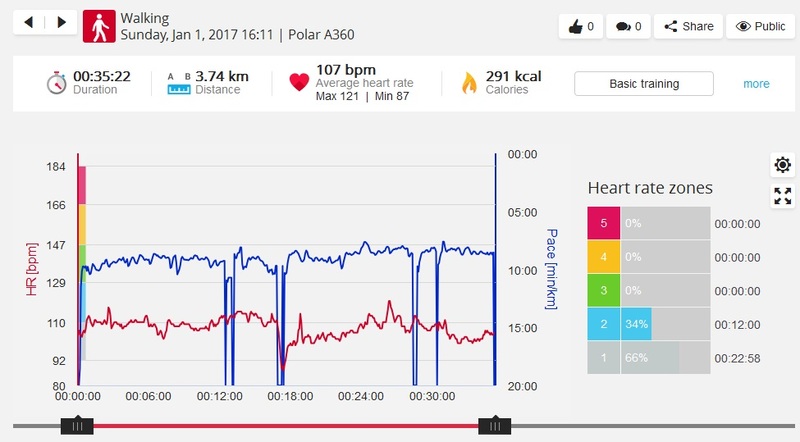 Last sporting profile I spent on the Polar Flow App and with a synchronisation passed to the A360 was Dancing. 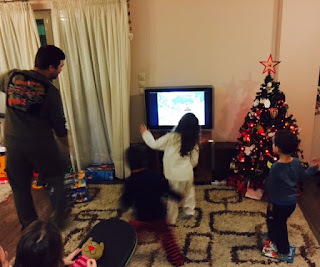 I tried to record a half-hour dance on the Nintendo Wii with the Just Dance kids game with 4 kids in the same living room. 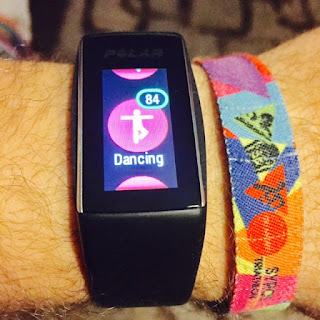 Unfortunately, the attempt was afailure, because after each song it was time to decide what the next song would be and the pulses were falling. Next time! 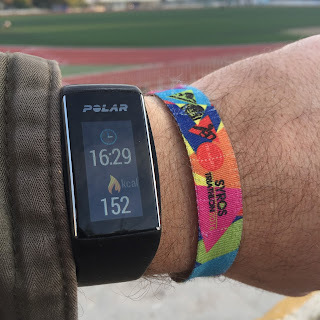 Well, so far we have used the Polar A360 in all our activities and it's time to see our entire activity as a whole per day / month and month. 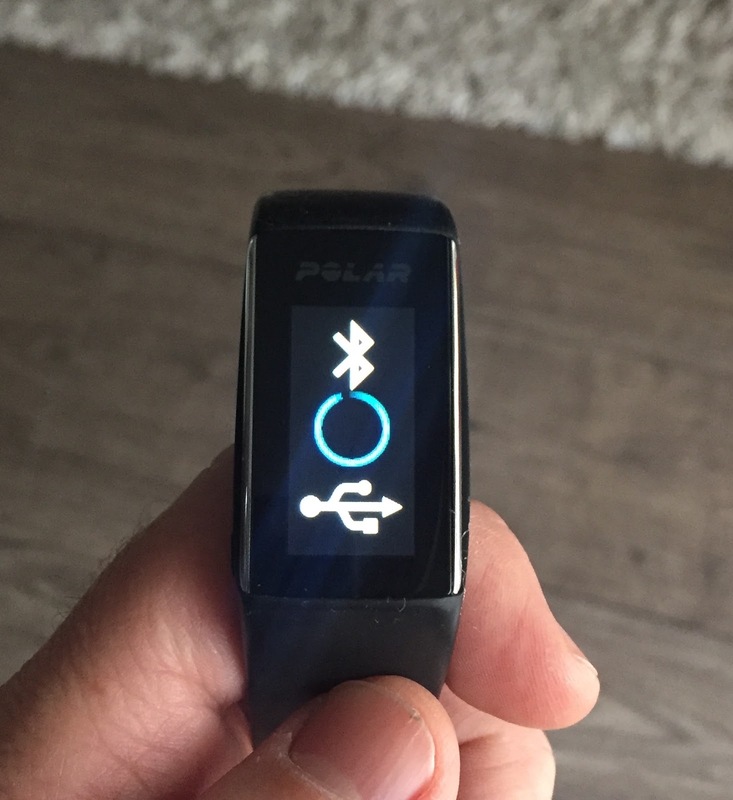 Having synchronized the Polar A360 we open the Polar App and select the Activity menu. There we select Day, Week or Month. It shows us the current day, week or month while we can look back on our past activity with a finger drag on screen. In our daily projection we see a 24-hour clock that is painted white to dark blue depending on the activity we are in. Sleep, sedentary posture, standing, walking or mild activity, intense activity. There is even gray marking for the time the device is out of the hand for charging or otherwise. On the day of the picture, January 9 of 2017, there are two circles (swimming-cycling) that if we tap will open the corresponding activities recorded. Specifically, I did a bike early in the morning for a continuous hour while I was swimming at noon for half an hour (see corresponding sections for A360 recording on the bike and swimming). The white color depicts the time we are sleeping. The more continuous / incessant sleep we have, the larger white pieces are there. 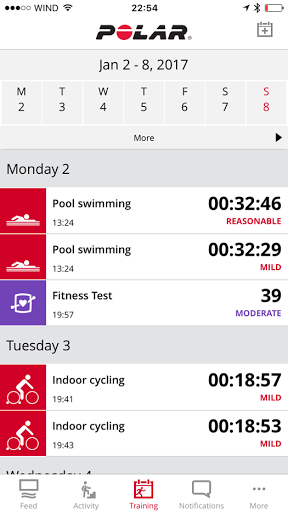 253% of daily activity was calculated for 1 hour cycling and a half hour swimming. Lot's of walking in the city. I reached 17531 steps. 0 inactivity stamps meaning I did not have a long inertia period in the day. 6 hours and 19 minutes of night sleep with 81% of that being characterized as quiet sleep. Graphical projection of mounts of time spent in sleep, sit,, stand, walk and exercise. It also has totals in days / hours for all of the above and so we quickly draw a conclusion on how many hours we had workouts, how many hours of sleep we had in total this week. Weekly achievement of daily goals, weekly steps, mileage coverage, active hours, and a calorie count. From what I see, I had a very sedentary Sunday without activity, and that day I also got an Inactivity Stamp. Exactly the same items as on a weekly basis but in a view per month. We wear the belt on the chest and press the sync button on the left side of the device. 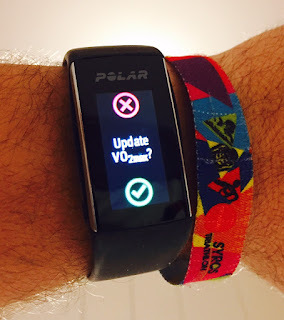 As soon as it appears "Syncing", we approach the A360 and touch it on the H7 pulse band. 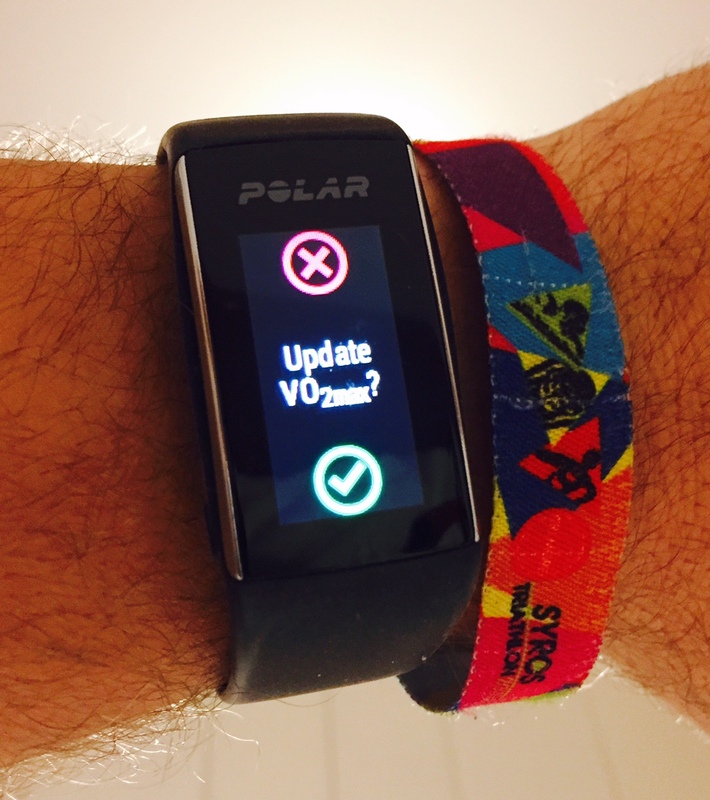 The A360 has found the Polar H7 pulse band. We tap on the screen to accept the pairing. Then we select the new Fitness Test option from the menu. The watch connects with H7 Hr belt and prompts us to lie down and relax. It takes about 5 minutes and we have to stay lying down and relax. We should repeat the test the same time each day so we can compare the data. Also an intense activity or anything abnormal from a health point of view is likely to affect the outcome. For example, personally when I'm sick with fever, my pulses are 10-12 above normal in a resting state. The result came out. 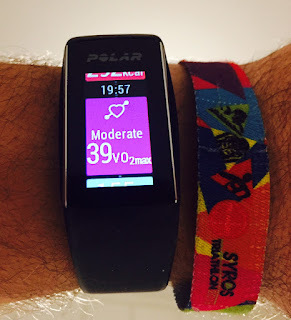 39Vo2max. 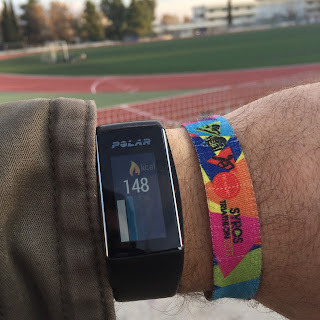 (The maximum oxygen absorption volume calculated from the pulses in this test) (My best measure was 51 before the Athens Marathon after a brisk training program). 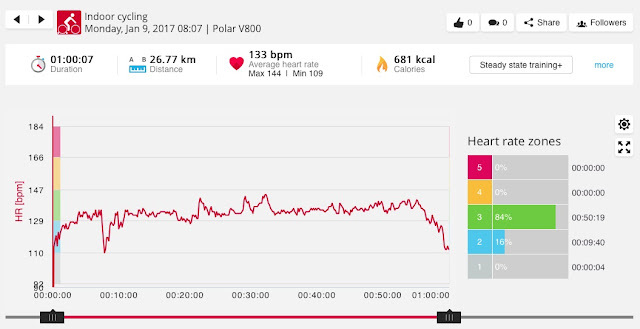 I decided to repeat the fitness test one week after having some intermediate midsummer training, swimming and cycling. 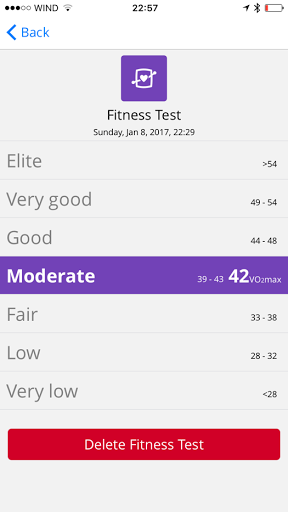 I got a 42 Vo2Max a week later. Note that you can not fool the test and get a better result. I tried to calm down-relax more, but the result was the same. 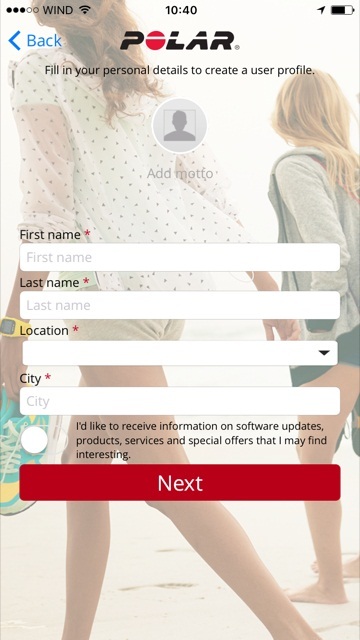 By clicking on the test we see details as well as the steps. By engaging in sports, physical fitness improves and one can also see its progress over time. 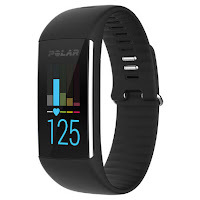 The Polar clock writes that the A360 battery lasts up to 2 weeks by doing 24/7 activity logging along with 1 hour training recording per day and having smart notifications disabled. 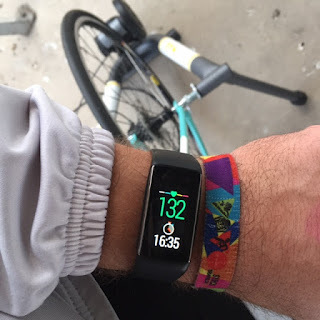 What is definitely a battery consuming is to turn on the screen every bit as well as to watch the results of the activities you have recorded. 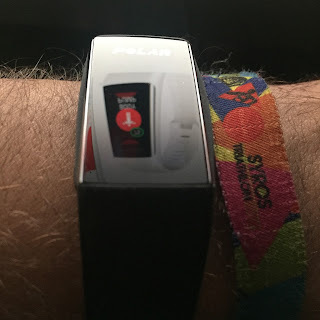 I think the maximum battery life can be reached with the smart notifications closed, the device in flight mode to have bluetooth closed and Do Not Disturb enabled (see Airplane Mode & Do Not Disturb) the screen is turned on by turning the wrist horizontally. (she thinks the clock has turned the wrist to see the time, but it can also be triggered for hours when we are getting ready for sleep. 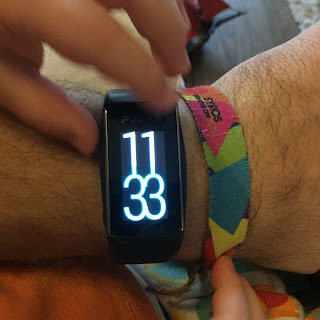 In practice, while I was in possession of the A360, I had Smart Notifications open, so each time the screen blinked with curiosity to scan it or to turn on the screen again for pictures that depleted before its time. Also after each activity I made a synchronization to see the results of the Polar App log. 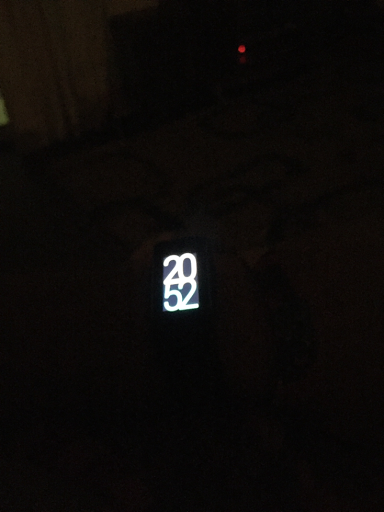 I imagine that if I put the synchronization on a weekly basis so that every Sunday night I would make an overall assessment of the week that passed by looking at the individual activity indicators per day (daily target, sleeping times, workouts), I would make a significant battery life. But below ... the device takes a little time to charge so why should I be deprived of all the possibilities of the clock? So I ended up having them all open and charging every 3 days at the bathroom. 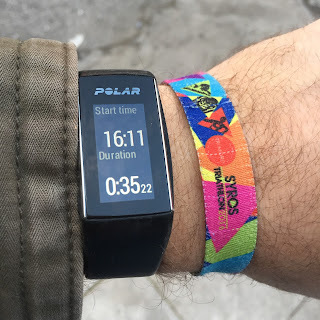 I see that an online coaching tool has been added, the Polar Running Program, which makes you a training program for 5km, 10km, half marathon and marathon, and you can watch the bands and the minutes of staying. The A360 is compatible with the Polar Running Program but can not instruct the user about these workouts at the time of training. 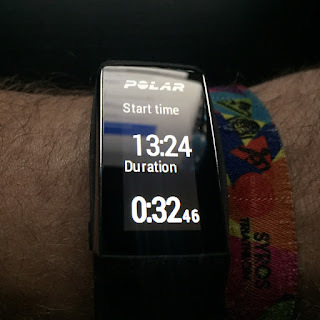 The user should see what he has to do on that day from Polar Flow or Flow App and do the corresponding workout by trying to find the respective minutes in each zone as suggested. The zone collation is the same. 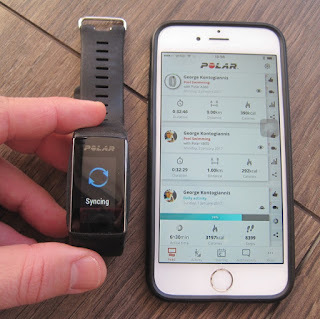 By saying compatibility I mean that any workout that the user will do on the day that has a certain workout from the Polar Running Program will count as a try for this workout. The polar footage of the Polar Running Program. Certainly worth viewing! 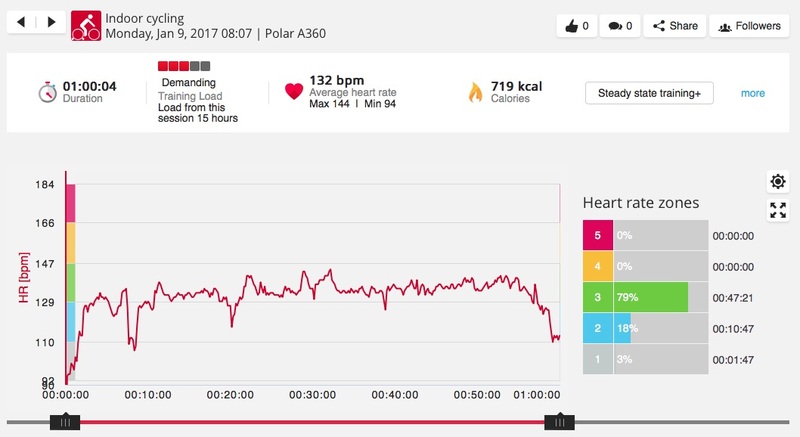 Overall, the A360 is a very impressive activity with Smartwatch capabilities, 24/7 recording of physical activity and sleeping with the ability to measure pulse wrists to calculate calories in our workouts. It covers a huge range of sports with a wide variety of sport profiles and simple everyday people who are not very involved with sports but want to improve their health and need an assistant to get in class and count steps and calories. 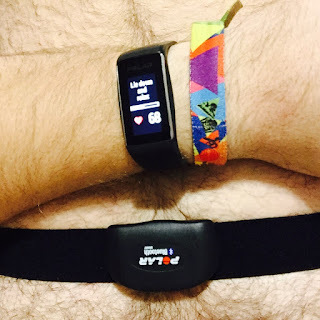 It is certainly in our benefit to have the ability with a tool on our wrist to see and imprint our activity but also to be able to analyze the difference in the quality of our sleeping nights in the days when we have caught our daily activity goal or not. 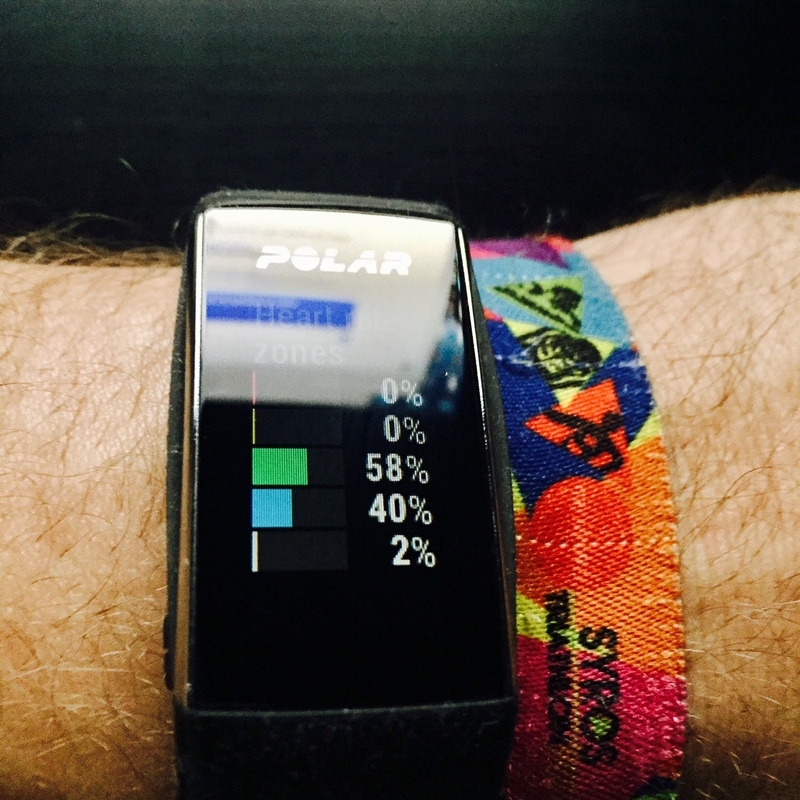 Polar Flow App and Polar App with the presentation of data for further analysis are great. The question now that it burns: would I buy it? I use the V800 as the main sports watch for the triathlon I'm catching. But I would not say not to wear the A360 everyday as a smartwatch so I do not wear out the much more expensive V800 in everyday life. So yes, I would buy it. Especially the possibility of easy change of straps I think is in the trumps as you can change color and match it to your clothes style more easily. Here is a clip that illustrated how the menus look, but the two activities I mentioned above, the bike and the swimming. Polar A370 is out !